Almost a year ago, the Ethiopian government announced the Addis Ababa Master Plan, which proposed an expansion of Ethiopia’s capital into surrounding farms within the Oromia region. The Oromo, who make up 40% of Ethiopia’s population, frequently complain about their lack of representation in the capital, and, following the announcement of the master plan, Oromo demonstrators gathered to show their disapproval and anger. The protests quickly turned violent. On December 16, 2015, Prime Minister Hailemariam Desalegn declared that he would show no mercy towards the protesters. In January, after 140 people had been killed, the government decided to withdraw the plan. In a statement, government officials claimed to have “huge respect” for the Oromo and explained that the opposition to the plan was based on a misunderstanding. For many protesters, this response was too little, too late. 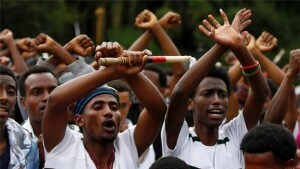 According to an Amnesty International report, even after the master plan was scrapped, the Ethiopian government continued to imprison Oromo leaders and marginalize members of the Oromo ethnic group. Protesters refused to go back home, and their demands broadened to include fair political representation and basic human rights protections. Though Ethiopia claims to be a democracy, countless hurdles impede the formation of rival political parties and their attempts to obtain power. For the Oromo, their oppression at the hands of the Tigrayans, who make up only 6% of the country’s population, is unacceptable. It is also nothing new. The Oromo have been marginalized since before 1973, which is when they formed the Oromo Liberation Front (OLF). When the Ethiopian People’s Revolutionary Democratic Party (EPRDF) came to power in 1991, the OLF joined the transitional government. Unfortunately, it was not long before the EPRDF created another Oromo party, the Oromo People’s Democratic Organization, in order to weaken the OLF. Now, the Oromo are back on the streets, fighting for their rights. Featured photo above provided by Reuters. This entry was posted in Uncategorized and tagged addis ababa, Amhara, Amharic, EPRDF, ethiopia, Oromia, Oromo, tigrayan. Bookmark the permalink.